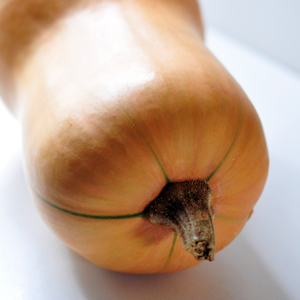 There are so many ways to use winter squash, and I never get tired of looking for new ones. The fact that we still have about 40 winter squashes of various types is certainly an influence on my thinking, I’ll admit, but even if I had to buy them, I would still enjoy finding new ways to cook them. For one thing, they are very inexpensive right now, especially as an end of season bargain at Farmer’s Markets and local veggie stands. Even if the grocery store is your only option, you will often find them on sale this time of year. 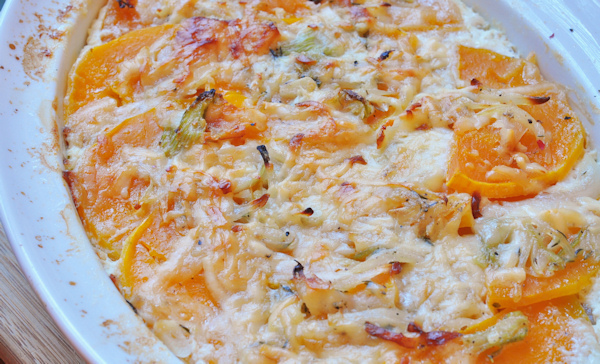 I used butternut for this gratin, because the smooth sides make it easy to peel and slice evenly. 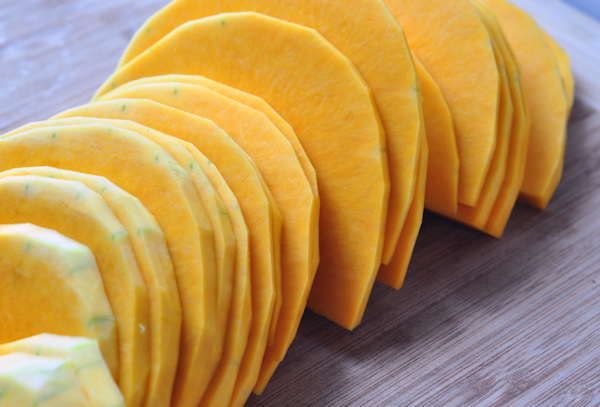 And even though butternuts are a very common variety, their rich flavor is always welcome. This is a free-form preparation, rather than an actual recipe. I used a squash that weighed about 3 & 1/2 pounds, though I didn’t need to use all of it – just the neck part, and I used a 3 quart casserole dish. The amounts of everything else are approximate, and can be varied to taste or what you have on hand. Begin by peeling the squash, and then cut it in half from end to end and slice the solid neck portion in about 1/4 inch slices. 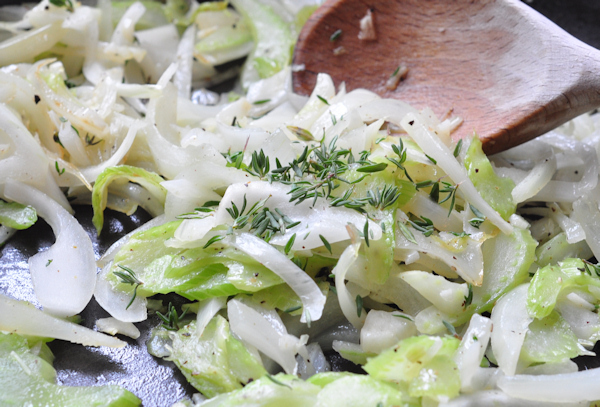 [you can scoop out the seeds from the bulb end and roast it, saving for another use] Melt a couple teaspoons of butter in a saute pan, and add 1 large celery stalk, cut in thin slices, and 1/2 of a medium onion, also sliced thinly. Sprinkle with a generous pinch of kosher salt, and cook for about 5 minutes, remove from heat and stir in the leaves from 3 or 4 good sized thyme sprigs and a small garlic clove, roughly chopped. This is a layered dish, so begin by oiling the casserole dish, and covering the entire bottom with a layer of squash slices, lightly sprinkled with kosher salt and a few grinds of fresh pepper. Spoon 1/3 of the onion/celery mixture over the squash. Sprinkle about 1 tablespoon of all purpose flour over the vegetables and dot with about a teaspoon of butter, cut in small pieces. 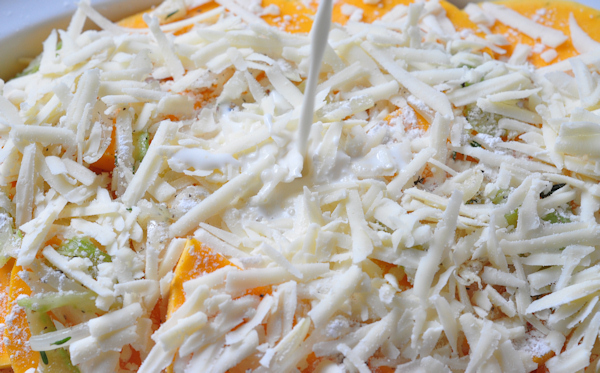 Then sprinkle on a generous amount of grated Asiago cheese – about 2 ounces. 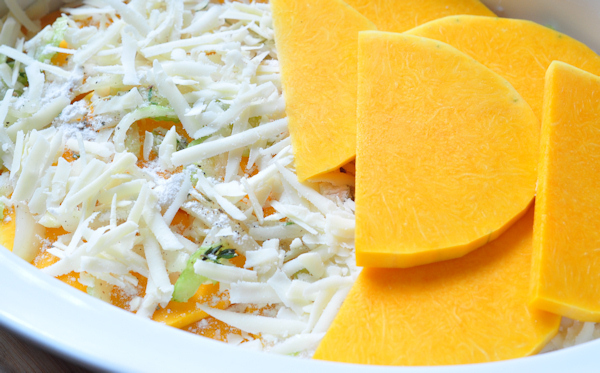 Repeat two times, so that you have 3 layers of squash, each topped with a layer of onions and celery, flour and butter, and cheese. Finally, slowly pour 1 cup of half and half over the top, in the process, trying to wet as much of the top surface as possible. 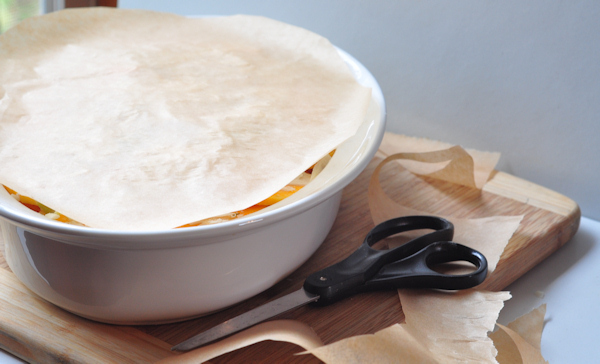 Cut a piece of parchment paper to fit over the top of the ingredients, and lay it flat on the top, pressing down on it slightly to compact everything a bit. Bake at 350 degrees for about 40 minutes, and remove parchment paper. Return to oven and continue baking until the squash is soft and the top is nicely browned – about 20 minutes or so more. It may take a little longer, depending on the age of the squash, so be sure it’s done before you take it from the oven. Allow to cool about 10 minutes before cutting. This is great as a side dish for roasted pork or chicken, and it would be great for Thanksgiving dinner. The salty sharpness of the Asiago is a perfect contrast to the sweetness of the squash and the thyme gives it a wonderful green note. And what could be prettier than those lovely layers? Enjoy! This entry was posted in recipes and tagged vegetables, winter squash. Bookmark the permalink. That is just beautiful – and looks delicious! I would not have ever though to use a squash like this. I always just boil and mash it. I think my family might enjoy something a little different, so I am going to see how they like this idea. Thank you for a wonderful idea! Looks great! I need to buy some more BN squash!! This looks so easy and yummy. I will try it very soon. 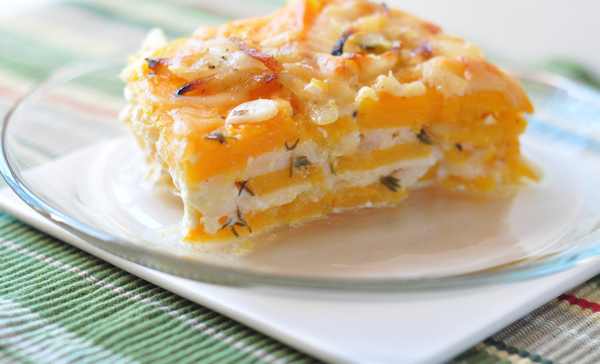 I grabbed some butternut squash on my way home tonight with this recipe in mind! I’ll let you know how we liked it! This looks fantastic! I love the squash layers here. It sounds so tasty with the cheese on the top. You have gorgeous photos here with lively colors. I loved them all!